As I’ve discussed before, certain firearms in this country fall under the purview of the National Firearms Act of 1934, which was our country’s first attempt at gun control. It regulated the sale of machine guns, suppressors, short-barreled shotguns (AKA SBSs), short-barreled rifles (AKA SBRs), destructive devices (grenades, etc…) and later, “Any Other Weapons”, a strange grey area I’ll get into in another article. The Act imposed a $200 tax ($5 for AOWs) along with a registration requirement on any items that fell into this category. The Democrats, not seeing the real root causes of the crime wave and the attempt on FDR’s life, chose instead to make a move on the Second Amendment, which is a hallmark of their Party to this very day. After doing some research and seeing that repealing the Second Amendment would be too difficult, the Democrats came up with the NFA of 1934. The initial Act called for the registration of all firearms within the US, and the taxation and registration of all arms produced after the date of passage of the Act. Of course, this would have amounted to a de facto nullification of the Second Amendment. Ironically, the tax idea was inspired by a racially-motivated gun tax in Alabama, where firearms were taxed just enough to keep them out of the hands of poor people, most of whom were black. The NFA tax was determined to be $200, which was a huge amount back then, considering most guns cost less than $20-$30. The tax would have been tantamount to a ban on all firearms. Thus, the first drafts of the bill were shot down, even in a majority Democratic congress. Later revisions only included handguns, which spawned the “idea” of the SBR classification. Lawmakers theorized people would avoid the handgun tax by chopping down their rifle barrels to a short length for concealment purposes. Though later the handgun registration & taxation requirement was dropped, the SBR, and SBS classifications, and yes the suppressor restrictions, remained intact. Shortening your rifle’s barrel below 16 inches meant it had to be treated like a machine gun, i.e. registered and taxed. At the time, it wasn’t a huge problem on a practical level for the gun community. Rifles had long barrels for accuracy and velocity, and shortening them decreased both. It wasn’t until recently that rifles became more commonplace in law enforcement, close-quarters combat, and civilian defense situations. 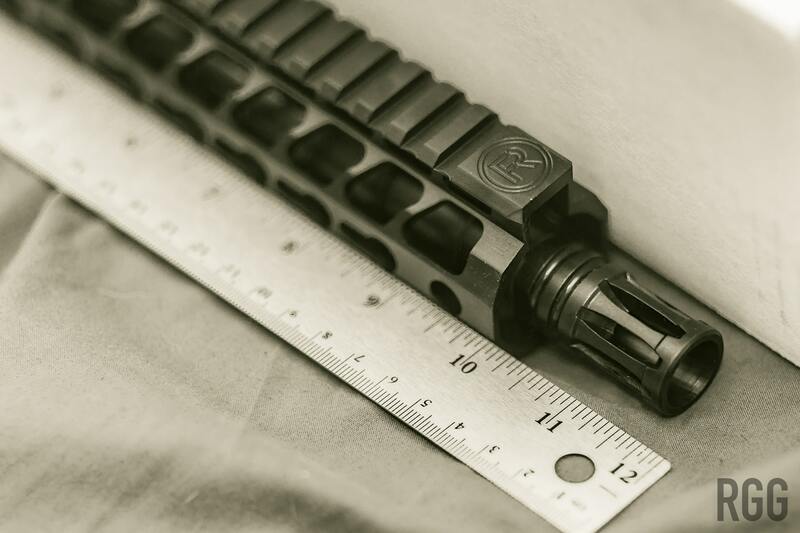 Studies done by the US military during the development of the M4 platform proved that the ideal barrel length for a rifle or carbine was 14.5 inches. This length provided enough accuracy and range for most close-quarters use, and allowed the soldier increased maneuverability in tight spaces. Law enforcement tactical teams, dealing with the same close-in environments, also adopted rifles on this length. Civilians engaging in self defense had only 3 options, however. Purchase a rifle of 16” or greater, sacrificing maneuverability. Build a rifle as a “pistol” where the barrel is shorter than 16”, but the rifle is not equipped with a proper buttstock. In order to be a rifle under the ATF’s rules, the firearm must have a proper buttstock. A workaround exists in the form of a pistol brace, which is not a proper stock, and the user does sacrifice comfort and ergonomics. Purchase or build a rifle as an SBR, and wait for the ATF to approve the paperwork and issue the $200 tax stamp. Right now the wait time for this process is in excess of 6 months. 6 months of waiting plus a $200 tax to pick up a rifle just because it falls under some arbitrarily-set barrel length. Plus, you’re another data point in some ATF database. Most people choose the first or second option, which both are compromise purchases. Your normal rifle isn’t ideal for a close-in encounter, and a pistol build with a somewhat-uncomfortable brace isn’t necessarily as accurate due to ergonomics. In other words, only the law-abiding are inconvenienced. Us regular guys and girls can’t easily acquire or build a proper home defense rifle, especially those of us who live in built-up urban areas, like me. As a test, I’ve done some drills with my Colt LE6920, which is a non-NFA firearm and sports a 16 inch barrel, and is over 35 inches in total length. The hallways in my home aren’t that wide. It’s just impractical. I’ve also done some drills with a pistol build of mine with a more manageable 10 inch barrel, and the experience is better, until it comes time to aim, which then the uncomfortable ergonomics come into play. Again, not ideal. I’d love to have an SBR, but I’m just not down with waiting 6 months for permission to build one, and paying $200 on top of the cost of the gun. The other day, user ursuslimbs on Reddit posted this interesting bit about an amendment to the NFA, which would benefit those of us who want to get an SBR, but without the hassle. This won’t require the battle over removing SBRs from the NFA. All it is is a tiny amendment to the SHARE Act: SBR barrel length changes to 10”, and SBR OAL changes to 19”. That’s it, that’s the only change. 6-7” measly inches. No muss, no fuss. For reference, the SHARE (Sportsmen Heritage and Recreational Enhancement Act) Act is an omnibus sportsman and hunting act designed to benefit the hunting community in our nation. In addition to several provisions to make the lives of hunters and conservationists easier, it also now has the Hearing Protection Act as a rider. It’s an old legislative trick, you include something a little controversial wrapped up in a package of other less-controversial bills so it’ll pass. The Democrats famously do this with gun control quite often. Again, sorry guys, it’s the truth. Anyway, the majority of SBRs out there are have barrel lengths between 10 inches and 15.9999999… inches. Why? It’s simple, in the most common caliber for rifles today, which is 5.56mm/.223, the efficiency and accuracy drops off severely below 10 inches. Yes, there’s pistol builds and SBRs out there below that, but those are mostly range toys that generate huge fireaballs due to the unburnt powder exiting the muzzle. In any firearm, you want the most powder possible to burn inside the gun for maximum efficiency, usually. Any powder that exits the gun will usually combust into a large and dramatic fireball. Fun, but not very useful. Arcane. Legalistic. Very boring. Won’t draw even a fraction of the opposition of outright SBR repeal. Not something that the Bloomberg orgs can whip their mailing list into a frenzy about. No red state Democrat will risk their seat by voting against the whole SHARE Act over this. In other words, the barrel length debate is so boring to non-gun people, that we have a good chance of slipping it under the radar. Yes, the SBR classification remains, and unfortunately there’s some calibers, i.e. 300BLK where it’s most efficient at 9 inches, but for now 300BLK users would have to deal with getting a 10 inch barrel, or doing a 9 inch pistol build, for example. Later on, we’d move to strike SBRs from the NFA entirely. Gun control creeped on us incrementally, i.e. the old lie of “Oh, just this one little thing and we’ll leave you alone…”, so I dare suggest it’s time we use the same tactics for great success against the opposition. It’ll require patience, but I can almost guarantee a win in the long term. But what about the $200 tax? Well, what about it? Yes, the government isn’t going to leave money on the table. However, there’s a few things in our favor with regards to the tax. The $200 tax over all NFA items processed in a year really isn’t a lot compared to the staggering multi-trillion dollar federal budget. Cut from somewhere, buy generic toilet paper for the Department of Education or something as opposed to three-ply, I don’t know. Also, the agency tasked with processing NFA forms, the ATF, actually doesn’t directly see the money. Yes, your check or credit card info goes to the Bureau of Alcohol, Tobacco, Firearms, and Explosives (and Really Big Fires), but those funds are “intercepted” along the way by the IRS. It’s a tax after all, and taxation is their provenance. When you send off your NFA paperwork, it goes to a mailstop in Atlanta, which belongs to the IRS. They take your check, money order, or credit card info, process it there, and send the forms and trust paperwork up to Martinsburg for the ATF to handle. The ATF doesn’t see the money directly, and most of the rank-and-file don’t care about NFA items, and consider the whole process to be a waste of time and manpower that could go towards dealing with real criminals. The NFA, in not so many words, is a joke, just like gun control in general. Supporters of it are either misguided, which if that’s the case, it is up to us to educate, or they are genuinely bad people and should be regarded and handled appropriately as enemies of individual rights. The types of firearms covered by the Act were rarely used in crimes prior to it’s passing, and have been used at the same level since. In other words, no change. The Act did nothing beneficial. Especially with suppressors and SBRs, the Act only serves as a delay on the exercise of the right to keep and bear arms, where the determination of the proper arms is up to the individual, not the government or faceless bureaucrats and busybodies. Support the incremental repeal of the NFA - let’s play the game like the gun-confiscators (because that’s their end goal…confiscation) and win some real victories.